I could be accused of purchasing eggplant simply to make this dish. Not that this is a bad thing. I have a wooden spoon permanently stained from turmeric. I may have, just a wee bit, tried to hide the remains of this dish in the back of the fridge where my husband can’t find it. The first time I ever tried any kind of curry flavored dish was in college when a roommate and I shared an amazing meal at an Ethiopian restaurant. She warned me that I would sweat curry the next day and she wasn’t kidding; the warmth that exuded from my skin was unreal. It was heady, and deep with the memory of the fragrant meal we’d consumed the night before and I would lift my arm to my nose repeatedly over the course of my morning to remind myself of the flavors. It’s no surprise that any type of curry dish, whether red or green or yellow, is at the top of my list in terms of my favorite taste. With or without coconut milk, whether searing hot with a heat that makes my heart beat just a bit faster and sweat bead at my eyebrows, or a mild gentle tease that touches my tongue, curry flavored dishes are tops. Eggplant. Chickpeas. Red onions. Fresh curry powder whisked with a splash of oil and just a bit of dark brown sugar to aid in caramelization. A hot oven. And 30 minutes. That’s it. From that point, all you need is a fork. Your house will smell truly amazing, and I’m telling you, it will be darn right difficult to resist eating the roasted curried chickpeas right off the baking sheet when it’s all done. They become dense and crispy, especially if you take a few moments after you’ve drained them to spread them out and pat them dry with a paper towel, and I’m sure you’ve heard by now that roasted chickpeas make a perfectly addicting snack? I’ve experimented with them already, and have, more than once, gazed at the enormous #10 foodservice size cans of them in consideration of purchasing. Crazy? Maybe. But once you try this, you may understand why that’s not so dumb a thought. But this dish? It’s a ‘Wow’ factor of 10. And an ‘Easy’ on the preparation scale. You’ll spend 10 minutes cutting and prepping, then you’ll pace for the 30 minutes it sits in your oven. Give the baking sheet a shake halfway through and that’s about it. 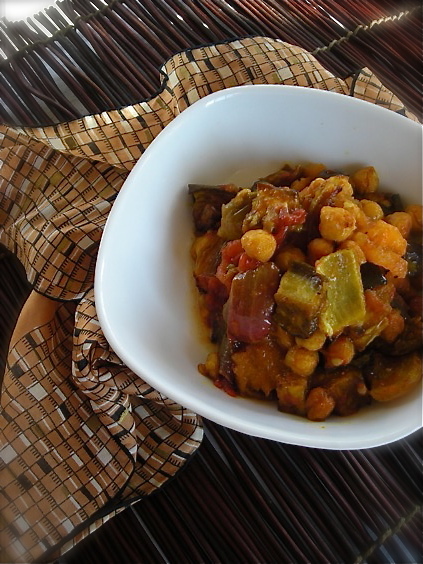 The eggplant cooks to a creamy dream, onions settle in soft and caramelized and those chickpeas…… oh those chickpeas. Hold me back. Good thing I’ve got that permanent turmeric-stained spoon. I’m going to need it. Whisk together the curry powder, sugar and oil in a small bowl. 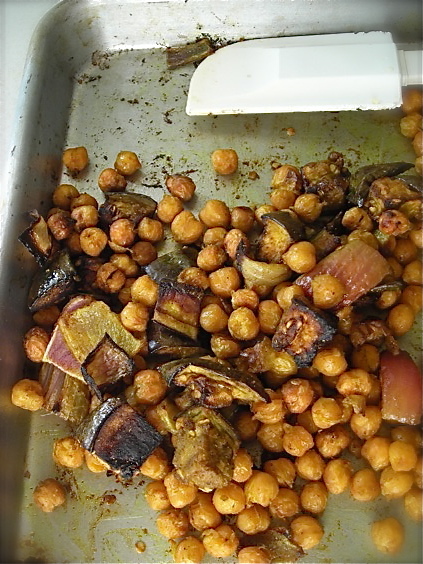 Combine the eggplant, onion, pepper and chickpeas, then pour the curry oil over and carefully toss together to combine. The eggplant will soak up the oil but don’t add anymore. Eggplant is a sponge; too much oil and it will be too soggy. Spread the mixture on a baking sheet and bake, shaking the pan once or twice about halfway through, for 30 minutes. This dish can be consumed immediately, but takes on deeper flavor if allowed to sit overnight in the refrigerator. Serve with naan or pita bread, over brown rice or on crisply toasted baguette slices. KATE’S NOTES: For additional amazing flavor, add two large tomatoes that have been roasted as well, but don’t place them with the eggplant. They take far less time. For a good method, check this recipe. I’m always looking for ways to make eggplants. This is a good one!